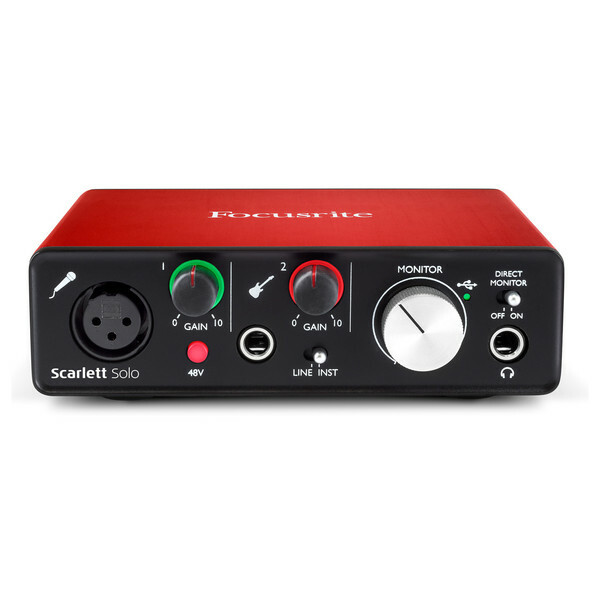 The Focusrite Scarlett Solo (2nd Gen) is a 2 in / 2 out USB audio interface designed for digital recording applications, featuring an improved sample rate of up to 192kHz for maximum audio quality. The 2nd generation improves every aspect of the original Scarlett Solo design, boasting super low-latency, new metal gain controls and an improved design. Another new feature is the latest Scarlett mic preamp which features a more balanced gain structure for optimal control over your levels. 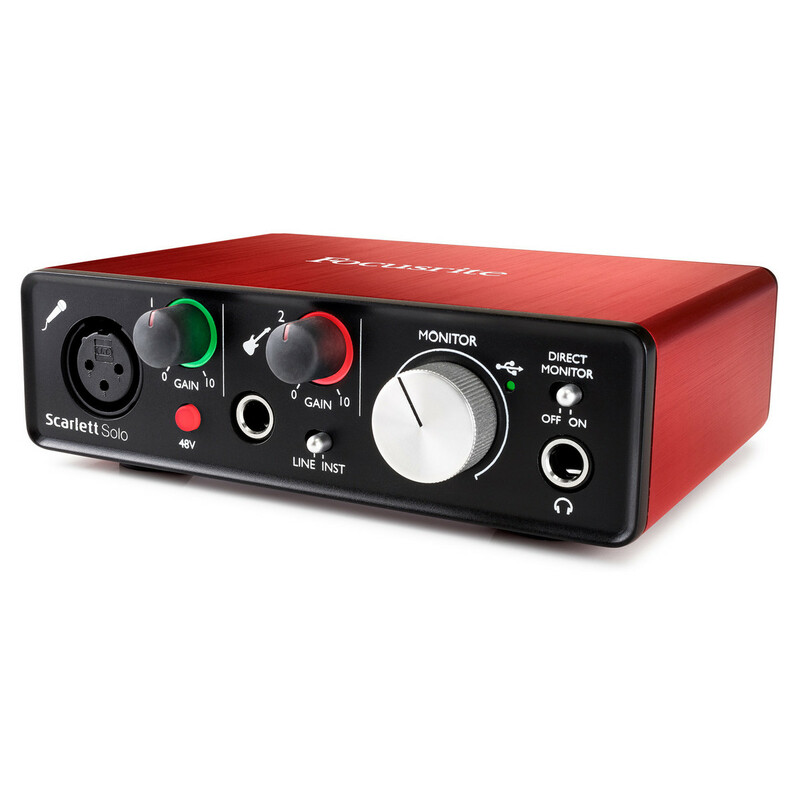 With its sleek, robust design and improved functionality, the Scarlett Solo (2nd Gen) is the ideal choice for a range of recording applications. The Focusrite Scarlett Solo (2nd Gen) features everything you need to turn your computer into a digital recording solution, improving on its original design to deliver maximum audio quality and performance. The interface features a 2 in / 2 out configuration, featuring both XLR and line/instrument inputs for recording microphones and instruments. There is also a 48V phantom power switch that allows you to connect and power condenser microphones, perfect for recording studio-quality vocals. You can also connect your headphones directly to the interface for monitoring purposes, allowing you to hear the audio signal as you record. The Scarlett Solo has been improved tenfold with a range of new features and functions that improve performance and audio quality. One of the most prominent upgrades is the new super-low latency performance. The super-low roundtrip latency improves performance and efficiency by minimising the delay between the original signal and the processed signal on your computer. This is paramount when recording vocals or instruments as it gives you the ability to record signals as close to real-time as possible. 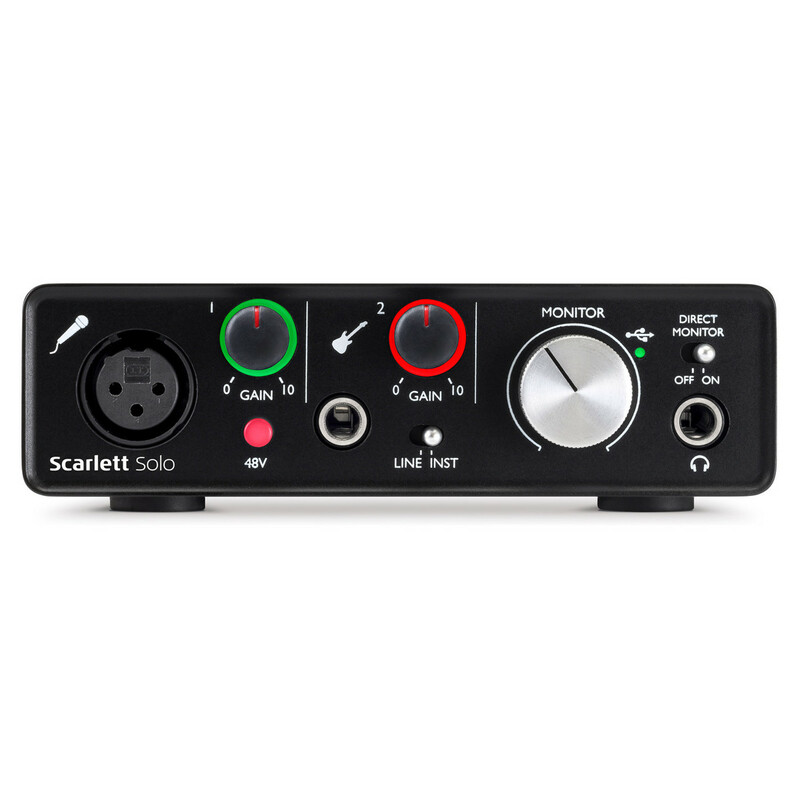 The Scarlett Solo now operates at a sample rate up to 192kHZ for maximum audio quality, perfect for capturing high quality recording from both microphones and instruments. 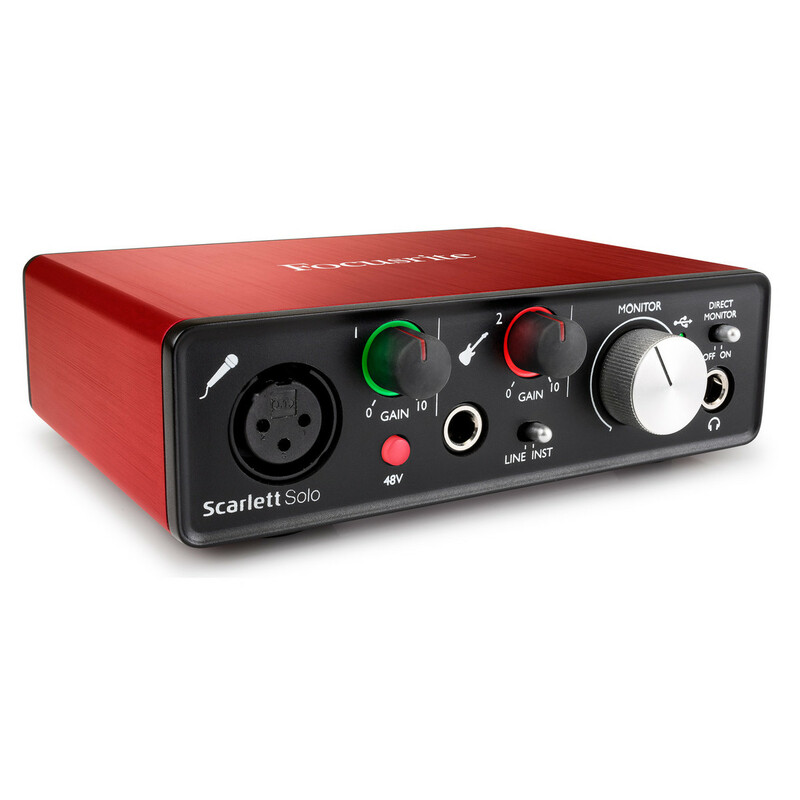 The Scarlett Mic Preamp has also been improved featuring a more even gain structure, allowing you to accurately set your levels, streamlining your workflow. Additionally, Focusrite has included analog protection circuitry for both the input and outputs to combat against unwanted power surges. The Scarlett Solo also features a brand new software bundle, providing you with everything you need to record, edit and mix your recordings. 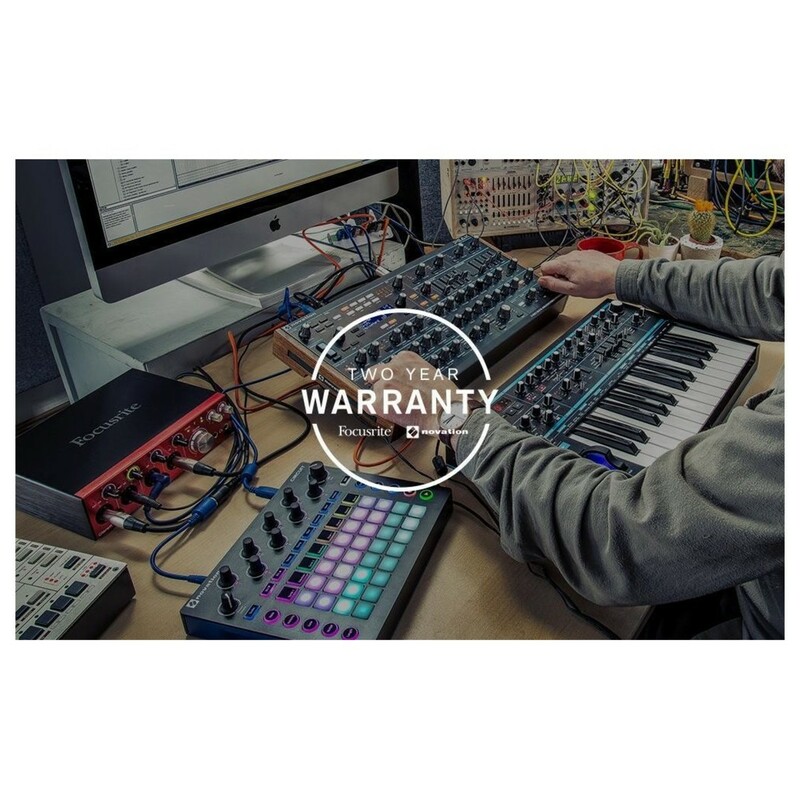 The new software bundle includes: Red 2 & 3 Plug-in Suite, Softube Time and Tone Pack, Ableton Live Lit music making software, Novation Bass Station VST with AU Plugin-Synthesiser, 2GB of Loopmasters sounds and samples plus Pro tools First (First Focusrite Creative Pack). This software bundle provides you with everything you need you get started out of the box. 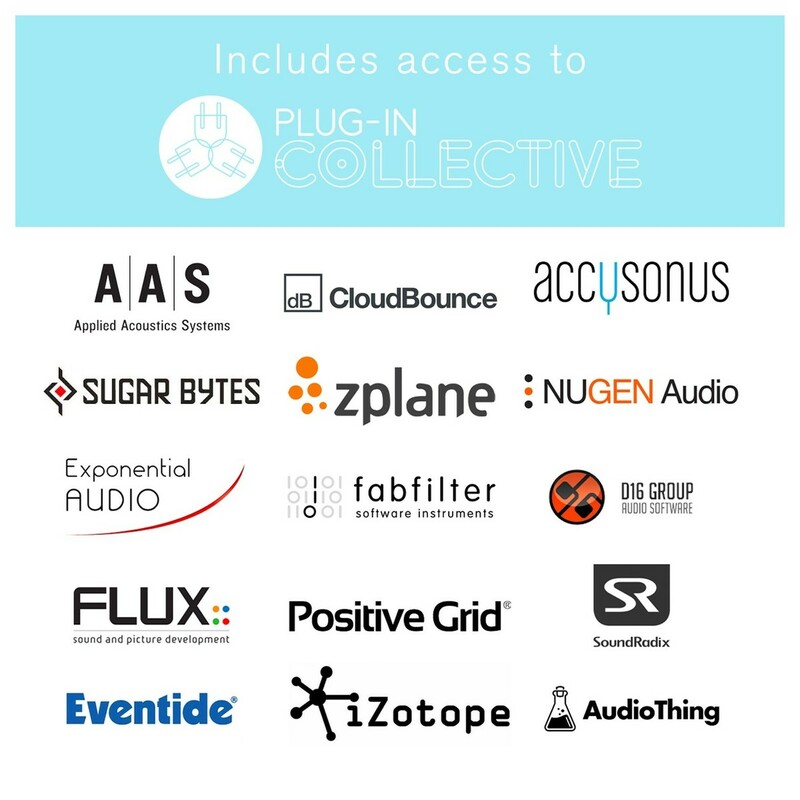 The addition of the Pro Tools First (First Focusrite Creative Pack) adds to its functionality, providing you with the Pro Tools First software and 12 free plug-ins. One of the most overlooked features of this audio interface is its compact size and lightweight chassis, making the interface highly portable. With its portable design the Scarlett Solo can be transported easily in a backpack or other carry case, allowing you to use your interface wherever you are. This can be advantageous for collaborating with other musicians who may not have the same equipment as you, or for recording in different places from your home studio. The interface itself is constructed from a red anodised aluminum unibody chassis for maximum durability as well as looking highly stylish. Monitoring and level control is handled by the front panel controls featuring a large monitor/headphone level dial plus individual controls for both the microphone and instrument inputs. 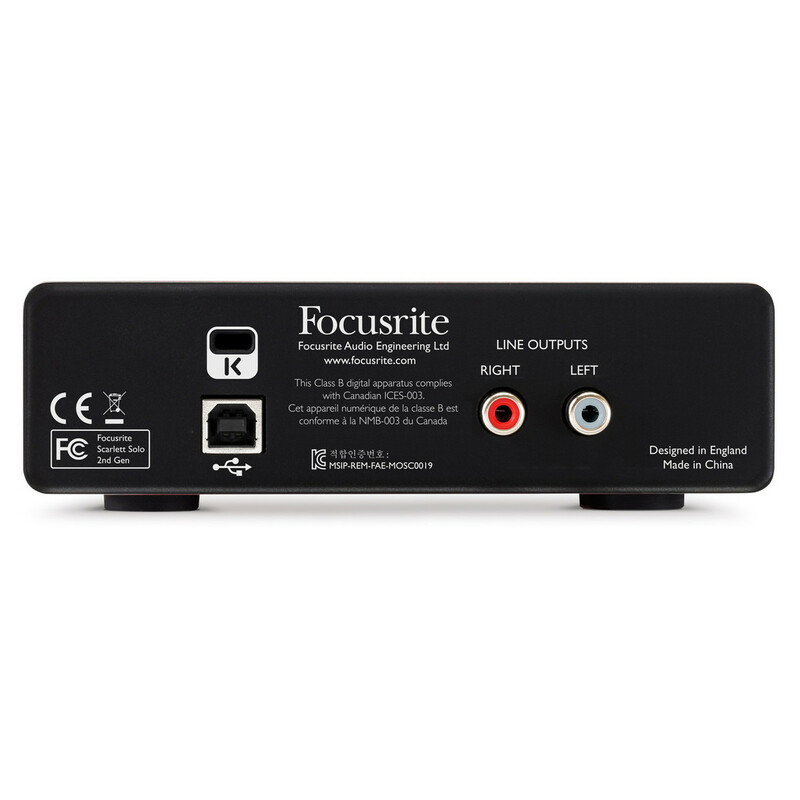 The rear of the interface features 2 monitor outputs (RCA phono) for connecting studio monitors to for monitoring applications.